JP 2007-05-22 600 points ? US 2007-07-09 600 points ? EU 2007-07-13 600 points ? 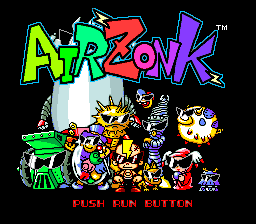 Air Zonk, known as PC Denjin: Punkic Cyborgs (PC電人) in Japan, is a shoot-'em-up developed by Red for the PC Engine and TurboGrafx-16. It was also released on the Wii and Wii U Virtual Consoles. It was followed by Super Air Zonk on the TurboGrafx-CD. Main article: Air Zonk/Magazine articles.